Every licensed amateur, regardless of membership in ARRL or any other local or national organization is eligible to apply for membership in ARES. Every licensed amateur can participate in ARES nets within their license privileges, however, additional training and certification is required to participate fully in ARES. 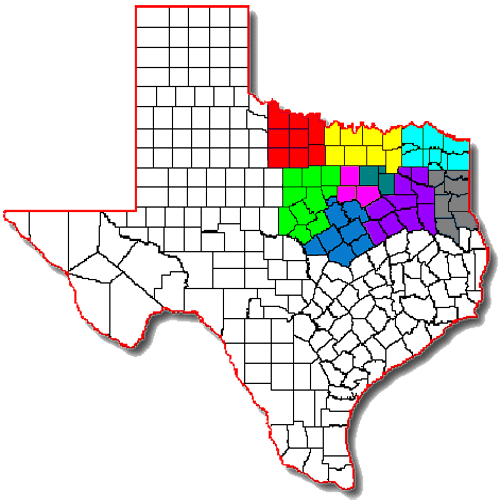 The North Texas Section has adopted the West Gulf Division Standardized Training Plan. Step One - Join ARES: Download and print the ARES application. Upon completion, submit the application to your local Emergency Coordinator (EC). You can find your local EC by clicking on your county or area on the map below. Step Two - NTX ARES Email Reflector: Join the NTX ARES email reflector. NOTE: You MUST be logged in to see the button below. Step Three - ARES Book Resources: If your EC hasn't provided you with one, start your ARES binder. You can download and print all of the material at the ARES Book Resources page. That page contains the ARES Operator's Manual, the Standardized ARES Taskbook adopted by the North Texas Section, and more. Step Four - ARES Training: Visit the ARES Training page and sign up for your FEMA SID (Student ID) number. Record that number in your ARES Taskbook, as you will need it to complete each of the required FEMA courses. Step Five - Participation: Participate with your local ARES group in training, nets, and activities.